The importance of the Grotto and its deteriorating condition are undisputed. Since 1993, efforts have been made to achieve a restoration of the grotto, with the support of many organisations including Garden History Society, Royal Fine Arts Commission, V&A Museum, London Parks and Gardens Trust, and National Heritage Memorial Fund. The establishment of Pope’s Grotto Preservation Trust in 2004 and the writings of Anthony Beckles Willson have succeeded in keeping the issue in the public eye and in the minds of successive owners. 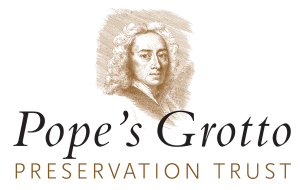 When Radnor House School bought the site in 2010, they invited Pope’s Grotto Preservation Trust to join them in developing an achievable project for the conservation of the Grotto. Previous proposals were studied and reasons for their failure understood. It was decided to undertake a modest restoration because the grotto is integral to the school buildings, therefore unsuitable for leasing to PGPT nor accessible to the public during school hours. Access would be increased on school holidays and weekends to a minimum of 35 days per year, thanks to an agreement with Strawberry Hill House adding the Grotto to their popular Landscape Tours, with additional visits by appointment. To compensate for lack of everyday access, a high-quality digital project will be developed to allow people at home and in other countries to understand the context and the genius behind the grotto and to see images of the finished restoration. In order to qualify for a Heritage Lottery Fund ‘Our Heritage’ grant, the Trust needed first to obtain a conservation report, scheme design, budget, and listed building consent. With funding from The Pilgrim Trust and Leche Trust in early spring 2015, these were prepared by Donald Insall Associates, who had previously worked on proposals for the Grotto in 2005. The application for listed building consent was lodged during September and approved in November. The £250,000 project will involve the careful cleaning and re-fixing of the minerals that line the grotto, an appropriate lighting scheme that will evoke Alexander Pope’s sparkling reflections from the river and candle light mirrored in the stones and glass. An uncovered area of floor and the vestige of the rill that previously ran through the grotto will be visible behind a glass viewing panel. The innovative visual reconstruction to be undertaken by Bath and Westminster Universities, led by Professor Paul Richens, will recreate the Twickenham village riverside and Pope’s villa and gardens in 1740 and will be accessible online. Academic research will be undertaken into contemporary gardens, and local volunteers will research people, buildings, gardens, boats, wharves, and flora and fauna to provide authentic detail to the animators. Guides drawn from the community and from local schools, will be trained to show the Grotto to the public, and a storyteller will develop a performance exploring Pope the man and writer for family events at the Grotto, Orleans House Gallery, Strawberry Hill and other London venues. In a parallel project the Grotto’s statuary and carved elements, some of them dating to the 19th century, will be conserved. A development grant from Historic England early in 2015 enabled Odgers Conservation to prepare a conservation statement, and a bid for a main grant was submitted in September. Our match-funding target is £150,000 and contributions to help us achieve it will be very welcome. You can make a donation through our donations page.